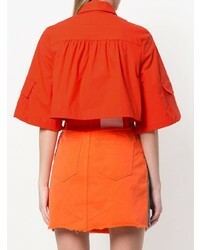 If you're after a casual yet totally stylish outfit, consider pairing a MSGM cropped boxy shirt with a white maxi skirt. Both items are totally comfy and will look fabulous together. If you're on a mission for a casual yet chic outfit, reach for a red cropped top and a beige floral full skirt. Both items are totally comfy and will look fabulous paired together. You could perhaps get a little creative in the shoe department and dress up your ensemble with red suede pumps. If you're looking for a casual yet absolutely chic outfit, reach for a MSGM cropped boxy shirt and grey check tapered pants. Both pieces are totally comfy and will look fabulous together. If you're obsessed with relaxed dressing when it comes to your personal style, you'll love this chic combination of a MSGM cropped boxy shirt and light blue ripped boyfriend jeans. When it comes to footwear, this outfit pairs wonderfully with black canvas low top sneakers. 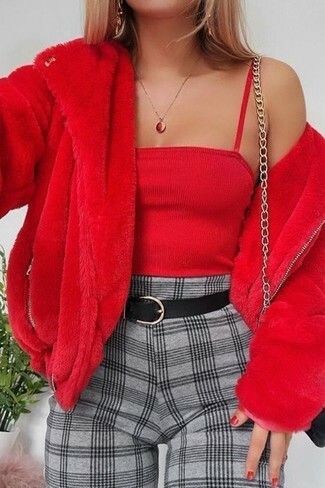 A red cropped top and black ripped skinny jeans is a great combination to add to your casual repertoire. When it comes to footwear, this getup is complemented perfectly with white low top sneakers. 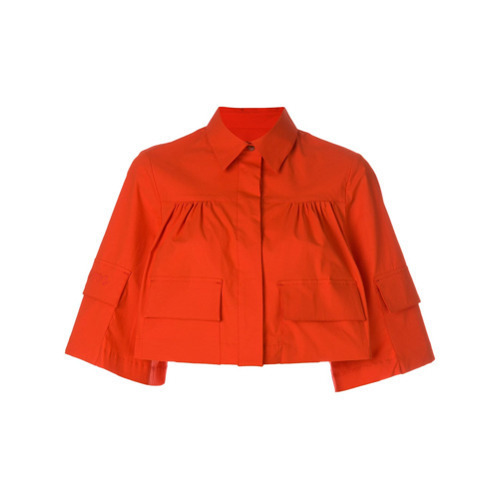 We all seek comfort when it comes to dressing up, and this combination of a MSGM cropped boxy shirt and a hot pink skater skirt is a perfect example of that. When it comes to shoes, this look is complemented well with dark brown leather lace-up flat boots. If you're scouting for a casual yet totally stylish getup, consider pairing a MSGM cropped boxy shirt with red flare pants. Both garments are totally comfy and will look fabulous paired together. 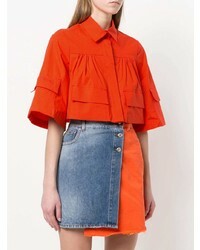 If you're on the lookout for a casual yet absolutely chic look, consider wearing a MSGM cropped boxy shirt from farfetch.com and a white and black leather pencil skirt. Both garments are totally comfy and will look fabulous together. Dress up this getup with white leather heeled sandals. If you're obsessed with relaxed dressing when it comes to fashion, you'll love this extra cute pairing of a MSGM cropped boxy shirt and blue boyfriend jeans. Bring instant interest and excitement to your getup with black leather pumps.